BELOIT, Wis. (March 1, 2018) – PlayMonster is thrilled to partner with Jeff Foxworthy and produce his comical new game Relative InsanityTM. The laugh-out-loud party game uses bits of Foxworthy material that mix and match to create wacky situations that families and friends will love! Everyone has a crazy friend or family member (or two or three…) and can totally relate to this game’s hilarious situations and humor! 2. Hell yeah they’re real! 3. It’s not my fault! It just popped out! 4. I think there was weed in the brownies! The reader then gets to choose their favorite punch line, and the owner of that card gets a point! Sometimes the punch lines you’re holding don’t really seem to match up, but that could make them even better…or insane! 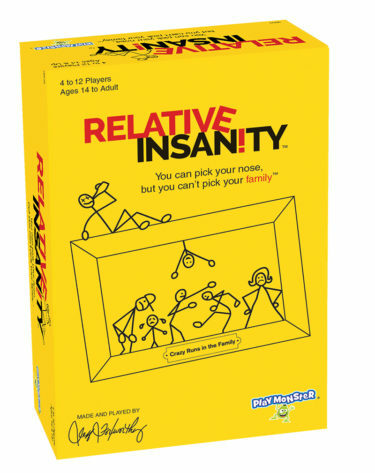 Relative Insanity includes 100 set-up situation cards and 400 punch-line response cards, so game play is never the same! For 4 to 12 players, ages 14+. PlayMonster will be bringing the game to retail for a suggested price of $19.99. Jeff Foxworthy is one of the most respected and successful comedians in the country. He is the largest selling comedy-recording artist in history, a multiple Grammy Award nominee and best-selling author of 11 books. Widely known for his Blue Collar Comedy Tour and redneck jokes, his act goes well beyond that to explore the humor in everyday family interactions and human nature.